Tiger Woods will make his return to professional golf at next week’s WGC-Accenture Match Play Championship in Arizona. Woods, who has been sidelined since last June after knee surgery, is the defending champion and also won the event in 2003 and 2004. 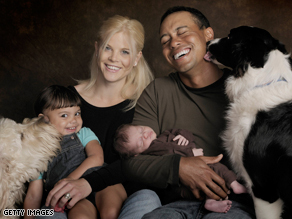 Woods has returned to the PGA Tour soon after the birth of his second child. “Elin and our new son Charlie are doing great. I’ve enjoyed my time at home with the family and appreciate everyone’s support and kind wishes,” Woods said on his Web site. The world’s richest sportsman has not played since beating Rocco Mediate in a playoff to win the U.S. Open Championship at Torrey Pines, his 14th major title, last June. Woods had to go through the pain barrier to secure an epic victory, but shortly afterwards underwent extensive knee surgery which brought his season to an abrupt finish. Speculation has been mounting about a date for his return, with his caddie Steve Williams telling Television New Zealand earlier this week that Woods was “95 per cent fit.” This week, Tiger Woods released the first photos of his new baby boy. Charlie Axel Woods was born on Sunday, February 8, and is the second child for Woods and his wife Elin.